By simply using a little wedge placed under the Spynamics Sacro Aligner one can achieve an effective, dynamic, safe and gentle decompression (traction-stretching) of the lumbar spine. Our research and tests in comparison with several very expensive computerized spinal decompression machines showed at least the same effectivity as these devices in achieving an effective decompression and a fast reduction of stress and pain in the lumbar spine on Patients with lower back pain (several different pathologies) and disc bulges (herniated discs). The wedge can be used as preparation for the active and dynamic Self-Realignment exercises with the Spynamics Sacro Aligner and may due to its relaxing effect enhance the Re-alignment process during the normal use of the tool. It is advised to visit your physician prior to use the Spynamics Sacro Aligner as Back Pain may have other causes than Misalignments in the structural system. Start with the normal routine (active movements) using the Spynamics Sacro Aligner following the instructions for a few minutes (~ 3min) before standing up slowly and carefully. How can you get the decompression wedge addition to the Spynamics Sacro Aligner ? The decompression wedge is usually shipped together with the Spynamics Sacro Aligner in all new orders (» only if available), or self made using any firm material (e.g. Styrofoam or wood) following the correct dimensions (see information below!). » If you already own a Spynamics Sacro Aligner and want to order the Decompression-Wedge only please contact us and we will send it to you after you paid for the freight costs through extra payment using Paypal. » please contact (e-mail) us for details, thank you. 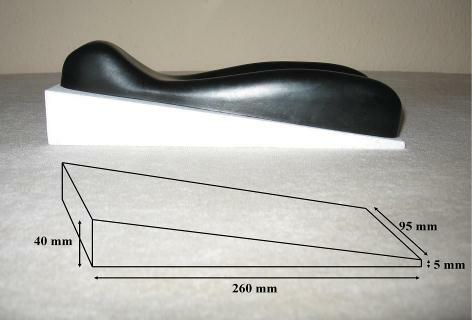 Please note: At this time only orders sent from Germany will be including the wedge, others have the option to order the wedge only (additional costs may apply!, e-mail for details please), or make their own following the dimensions featured here.